Emerson MoistAir humidifiers offer superior efficiency at providing comfortable humidity to your indoor environment. The HDC2R (HDC-2R) wicking humidifier filters (pair) give optimum performance in your Emerson Moist Air, Sears, or Kenmore humidifier. Of course, over time, water-borne minerals are naturally deposited on the filter's surfaces, reducing its ability to absorb and wick moisture. 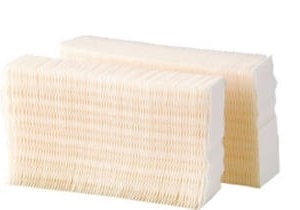 To ensure top performance it is necessary to replace your filters periodically. 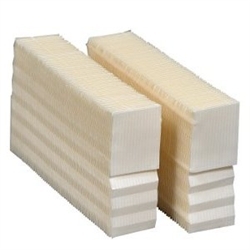 These Moist Air filters feature superior materials which outperform competitor wicks. Genuine MoistAir humidifier wicks are made with Trapmax, a material treated with anti-microbial and particulate trapping formula. Fits Emerson MoistAir humidifier models: HD-500, HD-6200, HD-7002, HD-7005, HD-70021, HD-70050. Kenmore Humidifier models: 1442, 14407, 14451, 144070, 144071, 144131, 144510, 758.14451, 758.144070, 758.144071, 758.144131, 758.144510, 758.299772C (14909, 29962, 32-14909, 32-29962, 42-14909, 42-29962, 03214909000). Approximate size: Each Filter 11" x 6.25" x 2.5"
Exclusive TRAPMAX honeycomb filtration system with anti-microbial properties.